Can detect almost all powder and granulated material stably. Its unique mechanism allows long term, stable detection of powder levels. A two-layered seal system and Mum design are employed to prevent powder and granulated materials from getting inside the housing. A variety of products available to meet a wide range of needs, from standard to special specifications. 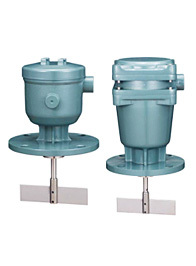 Standard flange types, resistant types, protection tube types, extension types, etc.. Pressure resistant explosion proof models are also available. A mum-structured sintered alloy bearing prevents leaks from the seals. The slip mechanism softens shocks to the vanes and shaft. Torque can be finely adjusted by the stepless static torque adjustment function. Lots of paddle type switches are available, including a type with a shaft protection tube, high temperature types, shaft extension types, and wire types. * Above is an example from the line up. Connect wire conduits using pressure resistant threads or use a pressure resistant packing . Securely prevents the intrusion of powder and granulated material thanks to an oil seal plus a 4-layer oil seal. * A 24VDC model is also available as an option.